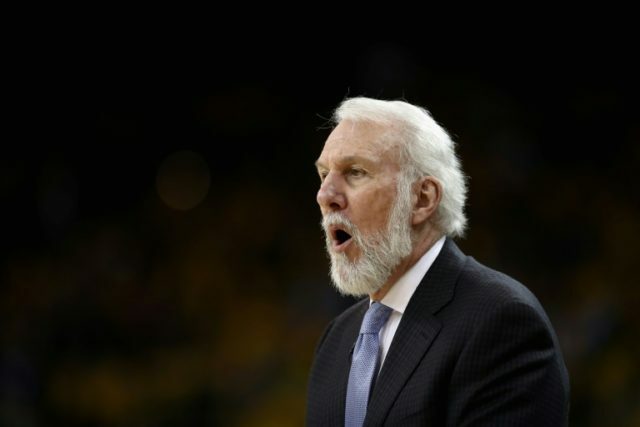 Los Angeles (AFP) – San Antonio Spurs coach Gregg Popovich will miss Thursday’s playoff clash with the Golden State Warriors following the death of his wife after a long illness, the team confirmed. Popovich’s assistant Ettore Messina will take over the coaching duties for Thursday’s game three, which comes a day after Erin Popovich passed away at the age of 67. “We’re all suffering a profound loss to a really important member of our family and our team,” Spurs general manager R.C. Buford said. Buford said Spurs coach Popovich had been “overwhelmed” by messages of support since news of his wife’s passing emerged on Wednesday, triggering an outpouring of sympathy from across the NBA. “Obviously I’m a huge Pop fan. I love Pop. That’s such a tragedy,” a visibly emotional LeBron James said after Cleveland’s win over Indiana. The 69-year-old Popovich is one of the most revered figures in the NBA, a winner of five NBA championships who has coached the Spurs since 1996, making him the longest-serving coach in the league. The Spurs are trailing the Warriors 2-0 in their best-of-seven Western Conference series.